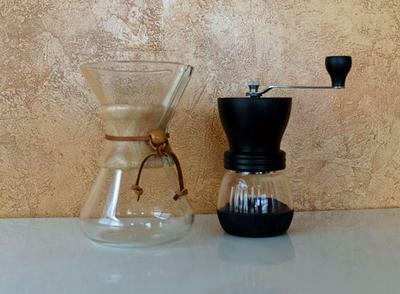 A Chemex brewer and Kyocera hand coffee grinder. I normally use a French Press and just yesterday bought an Aeropress. It's just my husband and I at home, but for when company comes I was thinking of getting a large Chemex. 1) I watched your video on the Kyocera ceramic grinder and wanted to know if you prefer that model over the typical steel grinders that sit atop a wooden box. I would like to start grinding my own beans so that I have the correct grind for whatever brewing method I am using. 2) Would the Chemex use the same grind as the French Press? First, let me apologize for being so incredibly slow to answer your question. I print all the questions out, as they come in, and somehow yours got totally lost – for over a year! Anyway, you pose a good question. The answer may come too late for you, but hopefully other readers will appreciate both the question and the answer. In answer to your first question, I do prefer the Kyocera to the traditional box-like grinders with steel burrs. For a couple of reasons. Ceramic burrs run a little cooler than steel burrs, and there are some coffee experts who think the extra heat burns off some of the oils and impacts the flavor of the coffee. I haven’t noticed this myself, and I’m not sure the argument would even apply to hand-grinding. For me, the bigger issue when it comes to small, hand coffee grinders is the control – or lack of control - over the fineness of the grind. The Kyocera gives you fantastic control. By adjusting the screw at the top you can adjust the distance between the burrs a tiny bit at a time. This is great for when you want to switch between grinding coffee for different brewing methods. My experience with the box grinders is that everything feels a bit looser, and some don’t let you adjust the grind size at all. As for your second question, no I wouldn’t user the exact same grind for both a French press and a Chemex. For the Chemex you want a grind that is about mid-way between what you would use for a drip brewer and a French press. In other words, the grind for the Chemex should be finer than what you use for the French press. My apologies again for the delay in responding! Comments for Ceramic vs Steel burr coffee grinders.